Would you like to help us learn more about younger siblings of children with autism? We would love to talk to you …..
All participants come to the Vanderbilt Kennedy Center for a series of assessment appointments, every 3 months over a 9-month period. All younger siblings receive standardized developmental testing, psychological assessment for autism, and a formal written report of testing results, including recommendations and referrals at no cost. Some parents receive training in strategies to use at home with their children. The mission of the SENSE (Social Emotional NeuroScience Endocrinology) lab is to better understand the social and emotional functioning of children with autism and related neurodevelopmental disorders and to translate findings into meaningful approaches and interventions. (NIMH) under grant number MH111599, (PI: Blythe A. Corbett, Ph.D.). This information or content and conclusions are those of the author and should not be construed as the official position or policy of, nor should any endorsements be inferred by NIMH. Vanderbilt University Medical Center is committed to principles of equal opportunity and affirmative action. Pubertal development contributes to significant physical, psychological, hormonal and social changes. It may be a time of increased vulnerability in youth with autism spectrum disorder (ASD). Our goal is to examine stress and arousal across pubertal development in children with and without ASD to identify potential risk factors, treatment targets, and therapeutic strategies. We are seeking a large sample of boys and girls who will be enrolled at ages 10-13 and followed annually over four years; specifically, from 10-13 years, 11-14 years, 12-15 years, and 13-16 years. Participants include children with a confirmed or suspected diagnosis of ASD (free evaluation provided) and children who are typically developing. Participants must have intelligence in the average range (IQ > 70). Participants will come to Vanderbilt University Medical Center for the assessment, which will include confirmation of diagnosis (for ASD group), psychological testing, as well as a brief psychiatric interview and physical exam. Results from the standardized measures will be compiled into a research letter provided to the family. 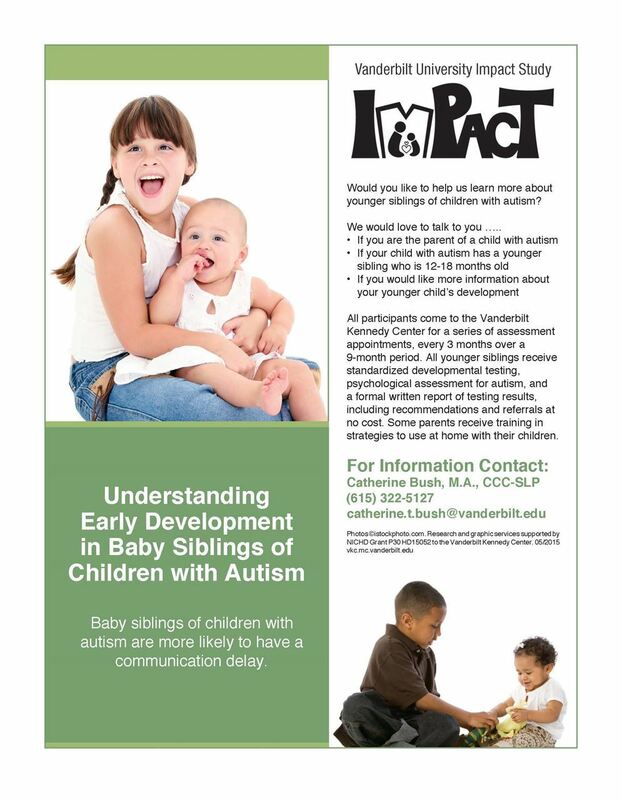 Do you have a child with autism spectrum disorder between 8 and 14 years old? Participate in our research study! Who are we? We are researchers at Vanderbilt University studying how children with autism spectrum disorder process different kinds of sounds in their environment. What happens in the study? Your child will be asked to listen to sounds while watching silent cartoons with an EEG cap on. The EEG cap is a net of 128 sensors that are made up of soft sponges that measures brain waves. There will be interviews and questionnaires for the caregiver. You will be reimbursed $50 for your time! Children with a diagnosis of autism spectrum disorder (ASD) ages 2- 17 years are invited to participate in a study looking at patterns of behaviors of children with autism at home, at school, and in the community. One goal of the study is to create a new tool that can be used in future studies to better measure if treatments are effective for children. To do this, we need your help! This study will take between 2-4 hours to complete. You will be reimbursed $100 for your time.